Jesus died for somebody’s sins, but not mine…. It’s one of the most jarring album-opening lyrics of all-time, and the fact that Patti Smith chose to begin her career with it is a prime example of just how audacious she was. When her debut album, Horses, which turns 40 this week, begins with that line, you know beyond a shadow of a doubt that she is not messing around. In a purely technical sense, the song that line is attached to is a cover of Them’s garage-rock classic “Gloria,” which itself began Van Morrison’s illustrious career. But really, Smith makes the song all her own, both with the lyrics she brings to it and the sheer energy. Really, Morrison laid down the template, and Smith ran roughshod with it, to the point that it really feels like an original. The rest of Horses continues with the mood that its opening track sets. It’s a powerful explosion of poetry and rock ‘n’ roll that was unlike anything the world had heard previously. Quite often, it feels like every track blends together into one long, beautiful rant railing against everything wrong with a society that was unwilling to accept people like Patti Smith. The influence of Patti Smith can be found everywhere. While you would never find an exact replica of her style and attitude (how could you? ), the music of the last 40 years has been rich with artists who have been influenced by her. You can witness her mark in the poetic art-rock of Kate Bush, the riot-grrrl rage of Sleater-Kinney, and the unabashed emotion of Morrissey. Even mainstream pop artists like Lady Gaga have been inspired by Smith’s audacity. But while Smith herself was an incredible force of nature, credit has to be given to her backing band as well. The punk energy of Lenny Kaye’s guitar, Ivan Kral’s bass, Jay Dee Daugherty’s drums, and Richard Sohl’s keyboards are the perfect complement to everything Smith does. If you doubt the importance of a killer backing band to bring fiery lyrics to life, consider the difference between another ’70s legend in Elvis Costello’s My Aim Is True, which featured plenty of bitter vitriol, but a middling backing band, and the follow-up, This Year’s Model, which was Costello’s first album with his long-running backing band The Attractions. While both albums are classics, This Year’s Model has music that does a far better job of complimenting its lyrics than its predecessor. In Smith’s case, she had incredible musicians from the get-go, giving her incendiary poetry the exact edge it needed. “Gloria” wasn’t the only classic rock ‘n’ roll tune to get absorbed into Smith’s universe; there was also “Land,” a brilliant 9-minute epic that interpolates Wilson Pickett’s “Land of a Thousand Dances.” The song, which also references “Bony Moronie,” “The Twist,” and countless other early rock ‘n roll tunes, builds a hypnotic groove as it transitions seamlessly from one part to another. Between this and “Gloria,” we see a common theme where Smith makes her own complex poetry with the comparative simplicity of old school rock ‘n roll. While Smith is often known for merging rock ‘n roll and poetry, she seems to be making the case that rock ‘n roll was always poetry; that “Blue Suede Shoes” is no less a piece of art than the works of Walt Whitman or William Shakespeare. She certainly makes a convincing argument. Even if you aren’t a fan of Horses (its rawness does take some getting used to), chances are several of your most beloved albums wouldn’t exist without it. 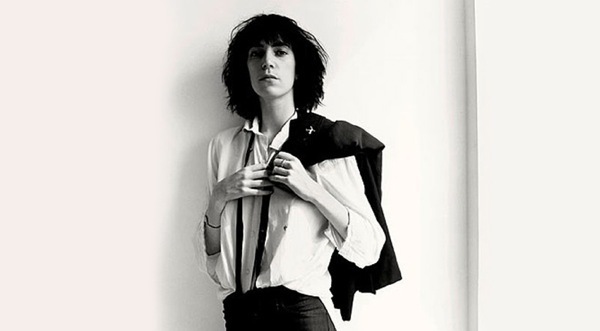 Really, it’s a good thing no one has tried to copy Patti Smith, partly because they would have no chance of succeeding, but also because Smith was such a champion of individuality. That so many artists who are just as inimitable and iconic as she is were inspired by her music makes all the sense in the world, and is a fitting legacy.